Day 3 was an early start. After a quick breakfast we made our way to Govardhan Hill which is located about 45 minutes from Vrindavan to do a parikrama around the hill. Parikrama means "the path surrounding something" in Sanskrit. It is a circumambulation around a certain object. The word parikrama is mostly used in the context of religious deities in a temple, sacred rivers, and sacred hills. Performing a parikrama as a symbol of prayer is an integral part of Hindu worship. Govardhan Parikrama (going 21 kilometres around the hill) is a sacred ritual performed by many believers for spiritual purification. The walk is done without shoes. 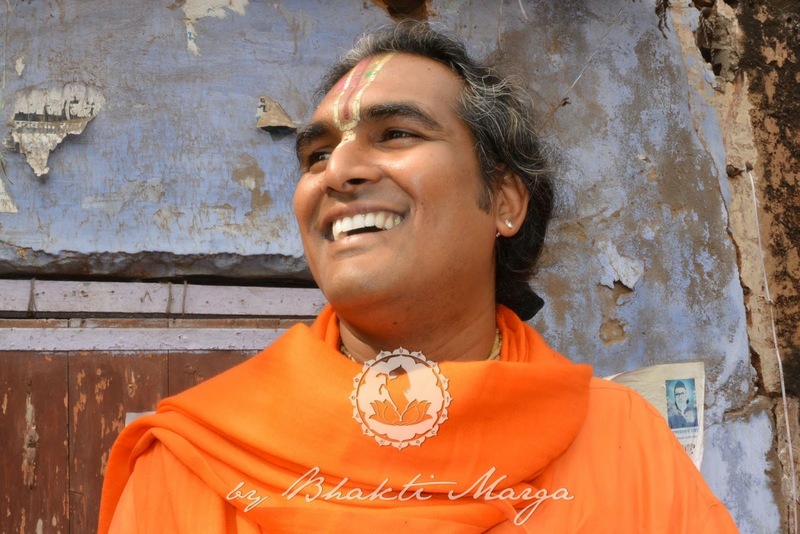 The quote at the beginning of the blog was the answer given by Swami about wearing shoes on the parikrama. According to the Srimad Bhagavatam, when Krishna was seven years old he saw the people making preparations for a yagna to Indra. On seeing this Shri Krishna advised the villagers not to do the yagna but rather a puja to Shri Girirajji (Govardhan hill) who not only protected them, but also gave their cattle grass and pure water for everyone to drink, and also small caves in which they could relax. This made Indra very angry and he decided to punish the people for listening to a child (Lord Krishna) and not him. Suddenly it started raining very heavily in Vrindavan and the rain and storm accompanying it were so strong that the people started trembling with fear and they approached Krishna to protect them. Krishna went to Govardhan and lifted it with His little finger in such a way that it formed a huge umbrella around the people. The rain continued for 7 days non-stop and Krishna used Govardhan for 7 days to protect the people. On seeing this Indra realised that this little child is no ordinary child but is an incarnation of the Lord. Indra accepted defeat and approached Krishna to seek His shelter. Since then Krishna was named Giridhari (bearer of Govardhan hill) and worship of Govardhan hill started instead of Indra in the entire region. 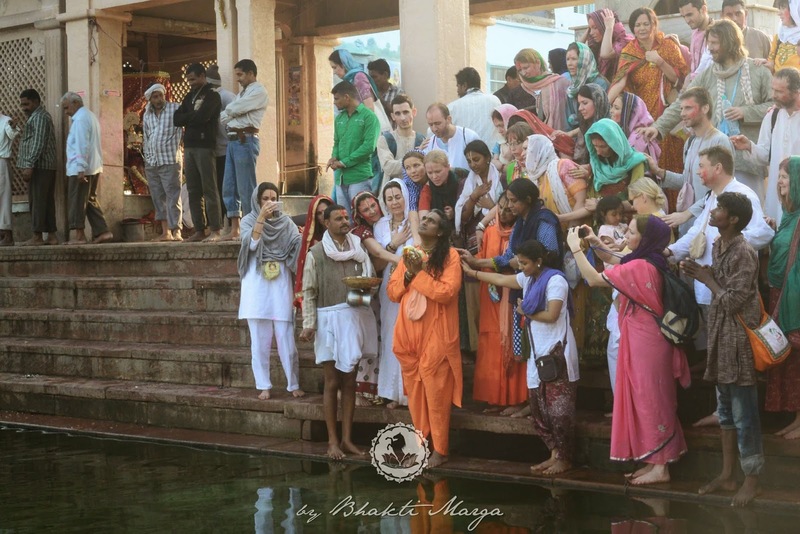 The parikrama started with Swamiji doing puja in front of Govardhan hill before the walk. It was very calm and serene. Swami and the rest of the group had our mala bags and we were doing japa throughout the walk. 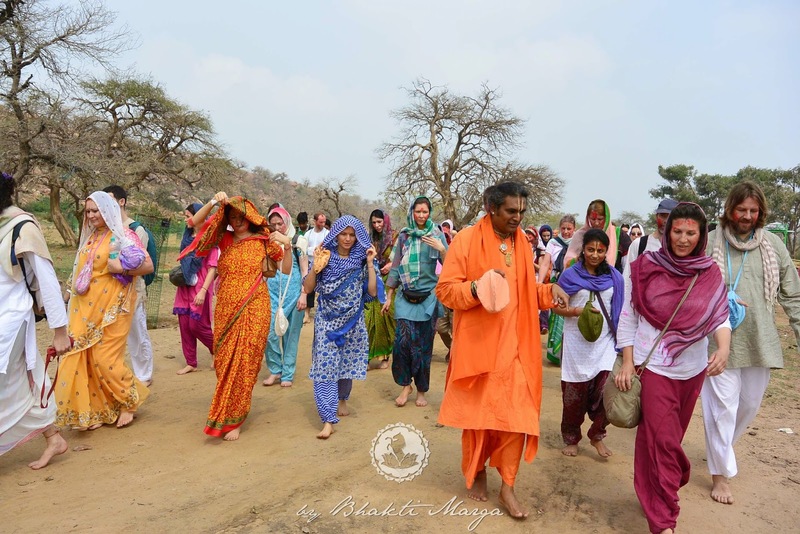 By Swami’s grace everyone was able to manage the walk without problems and rather than completing the entire parikirma we decided to go to Radha Kund and finish our journey there. It is said that when Krishna slayed a demon in the form of a bull, Radha “worried” about the karma associated with killing the animal, which is normally very sacred to Hindus, so She asked Krishna to wash His sins by taking dips in various holy rivers. Krishna being amused by Radha’s naivety simply struck the ground with His foot whereupon a mighty river came gushing out and formed into a kund (a small water body). In this place Krishna took a dip to please Radha. Radha in her child-like attitude became mad that Krishna used His powers to perform such an act and decided that Her and Her attendants would dig out a kund with their bare hands and bangles. 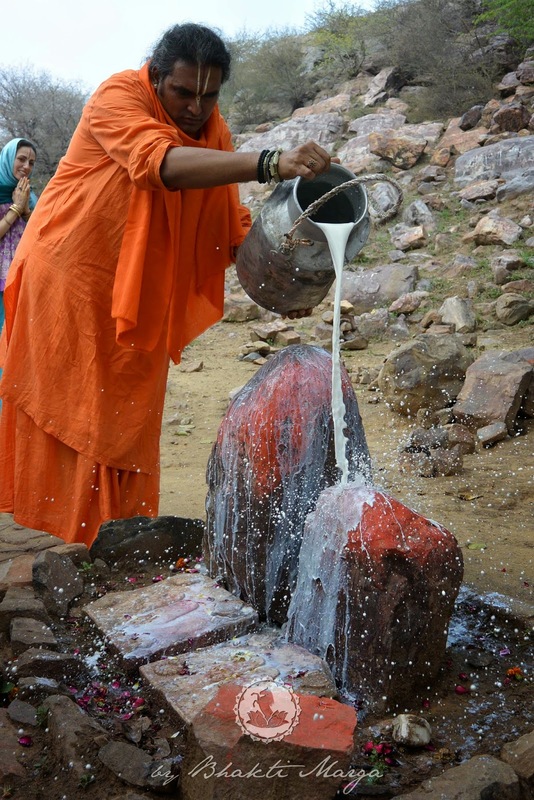 Once the kund was created they filled it with the holy rivers around the area. The kund is known today has "Radha Kund" where people come from all over to take a dip. After Radha Kund was filled with holy water, Krishna told Radha that He would bathe daily in Her kund. 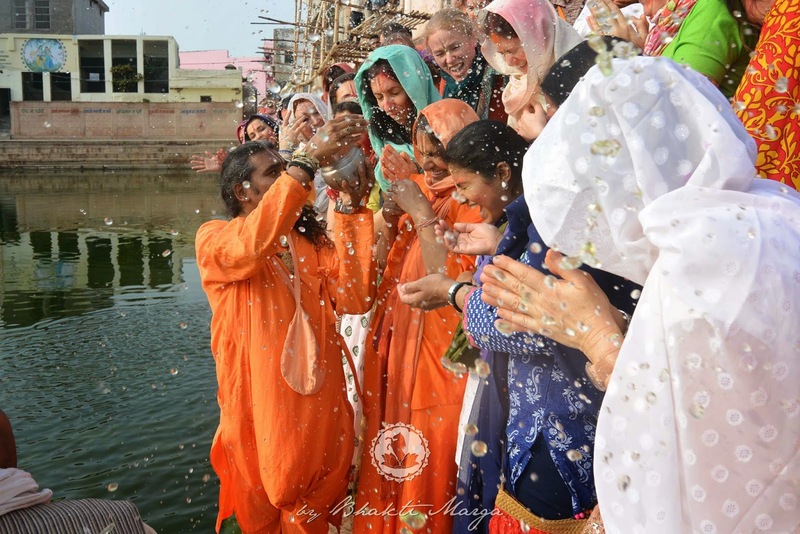 He declared that Radha Kund is as dear to Him as Radha Herself and anyone who bathes in it will receive Her love. Radha Kund is the personified Love of Srimati Radharani. After a long day’s walk around Govardhan Hill we ended the day by venerating Radha Kund, singing kirtan and doing puja to Giridhari.